The space shuttle Endeavour's 15-story external tank floats away after helping launch the STS-127 mission on July 15, 2009. This view is a NASA TV still from HD video taken by astronauts to be used to find where bits of foam insulation fell off the tank during liftoff. Astronauts on the International Space Station are taking abreak from spacewalking to perform some complex robotic maneuvers Sunday. The seven astronauts of the space shuttle Endeavour'sSTS-127 crew are on the third day of their dockedmission at the station. One major objective for the day is to use the shuttlerobotic arm to grab a container of spare parts for the station out of the spaceshuttle's cargo bay and temporarily stow it on the space station's robotic arm.The carrier is set to be unpacked Monday during the mission's second spacewalk. "It?s basically a platform and attached to the platformare three very large pieces of equipment," commanderMark Polansky said in a preflight interview. "If required at somepoint in the future, it?s basically a hot spare ready to go on orbit." Inside the container are a set of new batteries to power thestation when it is not exposed to solar light, as well as a spare antenna andpump for systems onboard the station. "We will be changing the batteries on the P-6 solararray, six large batteries that each weigh around 300, 350 pounds, the size ofsmall refrigerators," said mission specialist Dave Wolf in a preflightinterview. "That?s the oldest solar array system on the space station sowe?ll rejuvenate that solar array system." That robotic work will be carried out by Polansky and pilotDoug Hurley. Mission specialists Tim Kopra and Koichi Wakata will spend theirtime in the Japanese Kibo laboratory, calibrating the Japanese robotic armthere. Wakata also plans to replace some broken parts on a resistance exercisemachine on the station. The rest of the crew plans to make preparations for the nextday's spacewalk, including configuring the spacesuits and tools that willbe needed. The day will be slightly less hectic than it might have beensince mission managers determined a focused inspection of Endeavour's heatshield isnot necessary. This precaution is an option if NASA needs more data todecide if a shuttle is safe to return home through Earth's atmosphere. "Flight day five was where we had planned a focusedinspection if required preflight," said lead station flight director HollyRidings. "That is not required and so are going to move some of therobotic activities that were planned for flight day six a little bitforward." Though mission managers have not officially clearedEndeavour for re-entry, they think they have enough information to make thedecision from the first detailed inspection the astronauts conducted, as wellas a series of photographs taken by station astronauts as Endeavour approachedon Friday. SPACE.com is providing continuous coverage of STS-127with reporter Clara Moskowitz and senior editor Tariq Malik in New York. 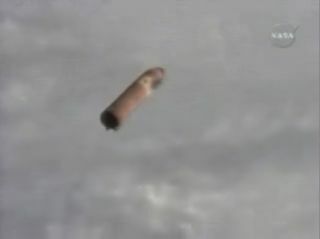 Click here for missionupdates and SPACE.com's live NASA TV video feed.